The stock market is at a facinating juncture at the moment. Currently there is a monumental battle going on between the bulls and the bears, as they both try to ascertain whether the American economy is going to go into a recession. This fear has been brought about by the official ending of the Bernanke policy of financial repression i.e. artifically induced low interest rates caused by the introduction of Quantitative Easing. To guage whether a recession is on the cards let us look at two of my favourite recession indicators: the Chauvet/Piger Recession Indicator and the NYSE Advance-Decline Line. 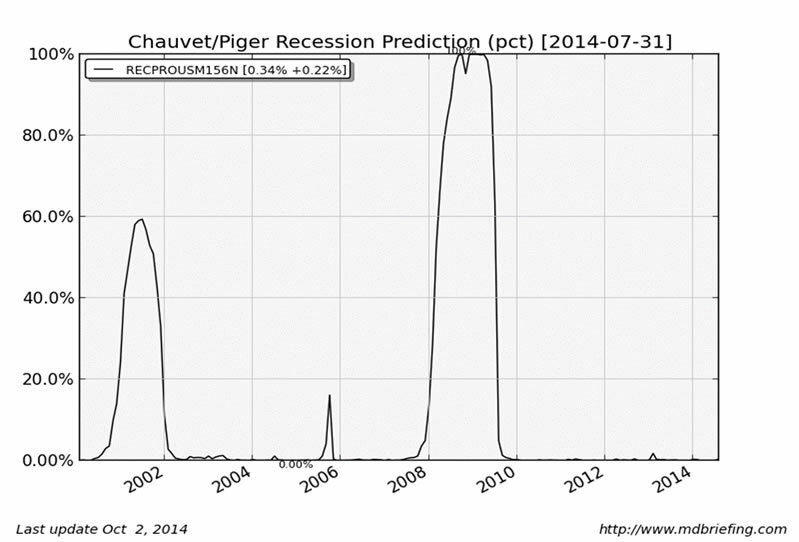 I attach below the current reading on the “Chauvet Piger Recession Prediction Indicator”, developed by economists Marcelle Chauvet and Jeremy Piger. Currently the reading is .34%, a very low reading indeed indicating that the probability of a recession is as near zero as possible. Historically, three consecutive months of averaged readings above 80% has been a very reliable signal of the start of a new recession. Conversely three months of averaged readings below 20% has been a reliable indicator of the start on a new expansion. In essence the Chauvet-Piger predictor is a synthesis of four economic indicators: Real Personal Income, Non-Farm Payroll, The Industrial Production Index and The Real Final Sales Index. All these indices are very bullish and thus there is no indication of an economic contraction. Now to the New York Stock Exchange’s Advance-Decline Line. When we look at the monthly and yearly charts below we see a definite degree of weakness but despite the recent market pullback no real technical damage has been done. The Advance-Decline line worked brilliantly fore-warning the last two major market contractions. Anyone who took note of the A/D 100 DMA crossing the 200 DMA in 1998 and 2007 avoided most of the pain of the 2000 tech crash and the 2008 sub-prime bust. A cursory glance at the charts above show the A/D line is nowhere near that technical cross-over point yet. Thus based on the above we see no evidence that a recession is in the offing. However while it would appear that there is no indication of an economic contraction on the immediate horizon it does not mean that the stock market will not go through a period of sustained volatility in the near future. I believe we are now entering a defining moment for the fledgling Janet Yellen Fed. The decisions she now makes from here on in will have crucial impact on the American and the global economy. Through her leadership the Central Banks of the world have got to get monetary policy absolutely correct. There is no room for error. The objective is clear and simple. With the ending of QE the Fed must not allow interest rates rise too high too quickly. Since 2009 the America stock market has risen rapidly on the back of easy money. The unprecedented monetary expansion has bloated PE ratios which are now at historically high levels. From here on in increased market valuations will only come through higher earnings not accounting multiplication. I think the current market volatility indicates that the jury is out on whether sustained earning growth will actually materialize in the year ahead. If the economic expansion can be maintained by Yellen, corporate earnings should continue to grow, although modestly. I think any growth will be good. Evidence of such growth would allow markets consolidate and enable the bull momentum to get back on track. However if the Fed loses control of interest rates, growth could contract along with PE multiples and this “double whammy” could bring about a market capitulation. Such a contraction in the wealth base of America could be the catalyst to a sharp recession given the fact that Europe is such a basket case, both economically and politically. Janet Yellen has a tough job to do in 2015. The timing and level of her first few interest rate rises will be critical as will be the market’s reaction. Thus in summary, while there is no technical evidence of an imminent recession, the issue will not be off the radar until the transition from quantitative easing to market based monetary policy has proved possible without excessive hikes in interest rates. I believe from here on the market is going to be a roller-coaster ride of volatility and worry, particularly around Fed meetings dates. While such market conditions may not suit the passive investor, for active traders such volatility will bring outstanding opportunity.